This problem only really started the day before yesterday when I used Audacity. After closing the project, I opened a Youtube link and noticed that sound was coming from my laptop speakers and not my headphones. Confusingly, the sound from the speakers is softer and seems to come from the back of the laptop when the headphones are plugged in compared to when it is not. I use a Dell XPS 15 with an Intel i7-7700HQ. I plug in the generic apple headphones, but the one with wires, not the new wireless ones. I use Linux Mint 19 with Cinnamon. I also tried uninstalling and then reinstalling alsa. It didn't work. I'm not sure where to proceed from here. I'm not very tech savvy, but I'll gladly post any more information any of you may need if you provide the terminal command for it. Last edited by kvnstv1 on Wed Sep 19, 2018 12:54 pm, edited 1 time in total. Hi kvnstv1, and welcome to the forum. Your situation seems a bit odd. The reason you're not getting sound from the headphones is shown on your alsamixer image. At present, they are muted. Open alsamixer again, press the right arrow once, then press m to unmute them. Follow that with the up arrow to increase the volume. With the info provided, I can't explain why sound was coming from somewhere in the computer, but maybe going back to pavucontrol after the headphones are unmuted can get it straightened out. Curiously, I can't mute the 'front'. I'm not sure why that is. PAVUControl still insists the sound is coming from my headphones. Should I try logging into Linux in recovery mode and seeing if the audio works? I've never done it before, but I know there are additional options for booting into Linux mint. It is a rather puzzling situation. I can't for the life of me figure out why it suddenly changed the way it behaves. I wasn't even on the terminal. Just Audacity. I said that my laptop doesn't seem to recognize the headphones I plug in, but it clearly changes behaviour when I do plug it in. So it doesn't seem to be a hardware issue. Thanks again or your reply. If you need any more information to diagnose the problem, I'll try my best to provide it. I think you misunderstood me a bit (happens often.) EDIT: Not so after all, it seems. In your first image of your first post, the headphones were muted. When you open alsamixer, Master is selected by default and is red like this: Master, so if this is still the same when you open it again, you'll want to press m to unmute is immediately. The volume is at 46, so press the up arrow a bunch of times until it is at least at 70 or higher. Then hit the right arrow so Headphones is selected. In the last image, it is no longer muted, but is at 0 for volume. Hit the up arrow over and over (or press and hold) until it is showing at least 80<>80 . Well crud. I just saw what you mean about it not changing (it should be showing 0<>0) but I'll get to that in a moment. 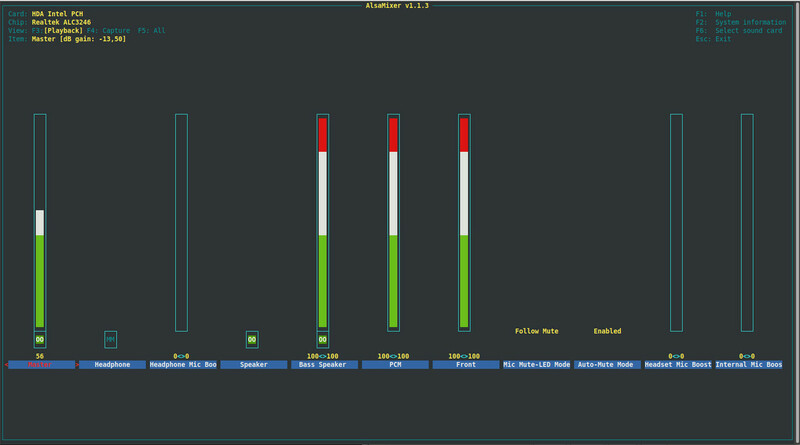 Now hit the right arrow twice to select Speaker then press m to unmute, and continue to Bass Speaker and do the same. Next, arrow over to the 2 selections with words above them and use the up or down arrows until they say Off. I'm trying to get you to unmute everything possible to make sure nothing interferes. Now the fun part. Keep hitting the right arrow to see if you can get past the last selection showing (Internal Mic Boo) and hopefully more selections will show up. For my system, the Headphones+LO is the proper choice for changing headphone volume. Hopefully you'll have something similar. I also have Headphone that is unmovable like yours. If none of this helps, maybe you need to go to pavucontrol and on the Configuration tab choose Analog Stereo Duplex, then on the Output Devices tab select Headphones (which are hopefully plugged in.) Even if it says Headphones (unplugged) make sure to select it. Thanks for your reply. I tried out what you said about unmuting the headphones bar. However, the value did not rise from 00. I tried playing around with alsamixer a bit more, but I still had no success. I tried using it in tandem with PAVUControl, and alsa just flat-out crashed. I was still very confused, and I needed the audio to work so I did a system restore using Timeshift to an image I had saved a month ago. And that did the trick. I can't really call it a solution, but it worked. I checked out alsamixer, and incredibly, the value of the headphones is still '00' ! When changing the volume, all that changed was something called PCM, and the value kept vacillating between 99 and 100. I have no idea what that is about. 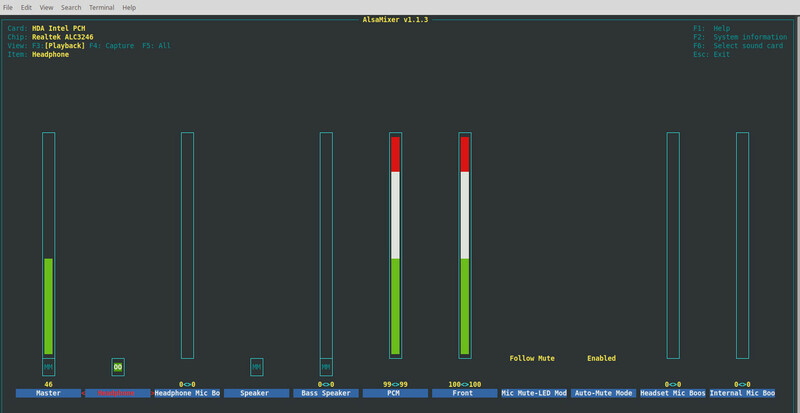 I checked the analog-output-headphones.conf file, and everything looks exactly the same. I can only think that using Audacity caused some change in the many other conf files stored there and one of them clashed and caused this mess. For the moment, my computer works fine. It is certainly not a hardware issue. Thanks for your advice. The whole experience has also taught me the importance of keeping backups in Timeshift. Should I go ahead and mark this as 'solved?' I mean, it isn't really, but my situation is ok now. Well, the situation is solved, but how it happened in the first place is still unresolved. I would go ahead and mark it solved if for no other reason than it will give others that find this thread the idea to restore a system snapshot. You can always change it if this situation returns later. If it does caome back later, we'll try some other methods of diagnosis to see if we can't get it resolved properly. Glad your system is working again.